When Trystan Reese and Biff Chaplow look back at the past year of their life together, it can be hard for the two men to see where all the time went. “I look back and think, that happened so fast,” Reese told NBC News from the family's home in Portland, Ore. “[However], there were times when it felt like the longest time of my life." That’s because in the past year a lot has happened for the couple, who have been married since 2013 and are the adoptive parents of two children, Hailey and Riley. One of their biggest milestones happened late last year when Reese — who is a transgender man — became pregnant with the biological child of Chaplow, who identifies as gay. Reese, who was assigned female at birth, went through hormone therapy but not surgery in his transition to male, and he was able to conceive a child not too long after he went off of testosterone. Sadly, their first attempt at conceiving a child ended in a miscarriage, but Reese and Chaplow were successful in their second try. Last month, Reese gave birth to a healthy baby boy, whom the two parents named Leo. 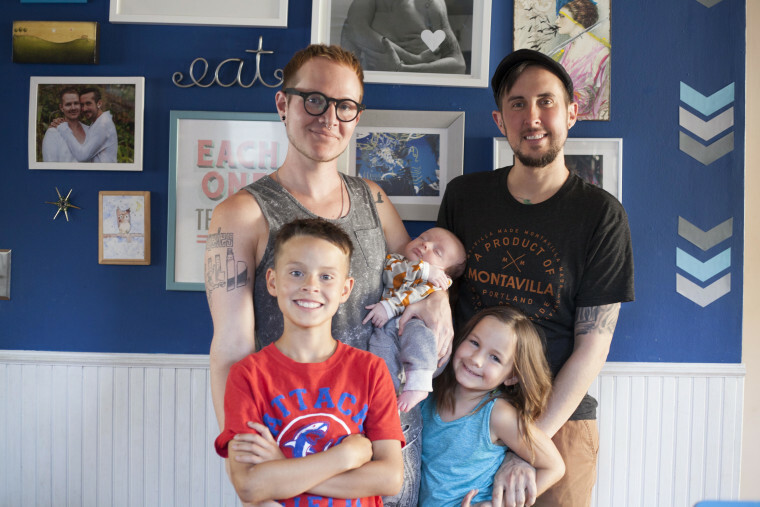 Now Reese and Chaplow are adjusting to their new life as parents to two young children and a newborn, and the two men say they will continue sharing their story in the hopes of helping evolve views on LGBTQ people and the families they build. When their pregnancy story went viral this past spring after they shared it on the popular parenting podcast The Longest Shortest Time — in segments titled "The Accidental Gay Parents" — Reese and Chaplow said they began to receive both positive and negative responses to their family. But the two men said the messages of support they received far outnumbered any negative backlash that was directed toward them. In another example of the positive change Reese and Chaplow are helping to create, Reese shared the story of his boss's recent trip home to rural Missouri. “I hope that people take away that there is not a set definition of what family looks like or what it means to be family and that all of us, queer or not, would benefit from the ability to choose our family." It is this discourse that Reese and Chaplow are helping to start that has made up for any of the negative attention the couple has received, and the two are still trying to determine how to best utilize the platform they have created. Reese and Chaplow said they had a positive experience with their health care provider during the pregnancy, and Reese said he often receives messages from other transgender individuals and their families seeking advice on how to begin their own journey into parenthood. “I let them know that I’m really sorry that the medical advice that they have received is not in alignment with science and … the newest research,” Reese said. He often directs people who reach out to him to different resources that he found helpful in his own pregnancy journey. For Chaplow, he hopes his family can continue to serve as proof that many paths exist to creating a family. “I hope that people take away that there is not a set definition of what family looks like or what it means to be family and that all of us, queer or not, would benefit from the ability to choose our family,” Chaplow said. The two men also admit now that the pregnancy is over, they are feeling more drawn to being politically active. “Everybody needs to be more public, everyone with a microphone and a voice needs to be a part of this resistance,” Reese said. But for now, the two need some time to adjust to their new schedule. Whatever the routine ends up being, Reese and Chaplow said they will do it together, as they have done for many years. When asked if they plan on having any more biological children, Reese was quick to answer.